Last week, Friday night. Ike woke me up around 1 a.m.to let him out. The weather has been beautiful and we’ve been sleeping with the windows open. As I settled into bed I heard a very strange noise outside. I’ve been reading the book Abraham Lincoln, Vampire Hunter, so my first thought was that the vampires were coming to get me. Then I thought it sounded like one of the chickens was being attacked. And finally I decided it was some sort of bird, maybe an owl except that it wasn’t the usual “who-who” sound. Next night, my brother was bringing Madeline home from babysitting and remarked that it was a full moon and the chickens would be in trouble that night. Which brings us to last Sunday morning. The sun was shining, blue sky, absolutely gorgeous weather. Rafe and I enjoyed our walk down to the chicken pen for morning chores. But there was a surprise waiting for us. Some kind of large bird had gotten its foot tangled in the electric poultry netting that surrounds the chickens’ range area and was hanging there upside down. The chicken it had killed before apparently getting hung up on takeoff lay on the ground beside it. It was hard to tell, the way it was hanging there, but I thought it was a hawk. Rafe be me a candy bar that it was an owl. Then we ran back up to the house to get Matt to come cut it loose. I owe Rafe a candy bar. A Great Horned Owl. The owl was already dead, probably having hung there upside down for a good part of the night. He was absolutely gorgeous. 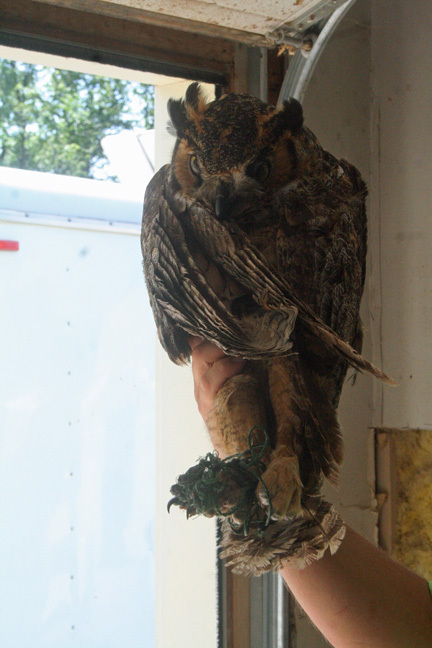 Big golden eyes, beautiful feathers that were incredibly soft, huge talons. Searching Google, it seems that the sound I’d heard a couple of nights before might have been owlets calling for food. (See #3 here.